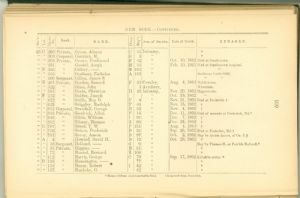 " " 306 Private, Grawe, Ferdinand F 42 " Oct. 10, 1862 Died at Smoketown.
" " 331 " Goodel, Asoph H 33 " Feb. 10, 1863 Died at Smoketown hospital.
" D 353 " Gillery, ------ E 103 " "
" " 355 " Gestbent, Nicholas A 103 " Antietam battle-field.
" " 395 Sergeant, Gillen, James S. "
" " 522 " Glass, John 3 Artillery, Weverton.
" " 561 " Gents, Christian H 20 Infantry Nov. 20, 1862 Hagerstown.
" F 572 " Golder, Joseph " Oct. 19, 1862 "
* Removed from Antietam battle-field.